This, of course is a very easy task, but since it is a common mod, I figured I'd snap a few pics to make an official write up for it while I removed mine. The stock rear sway bar does not do a great job of anything. Most people can't detect a difference in ride quality after removal, and removing it increases articulation. 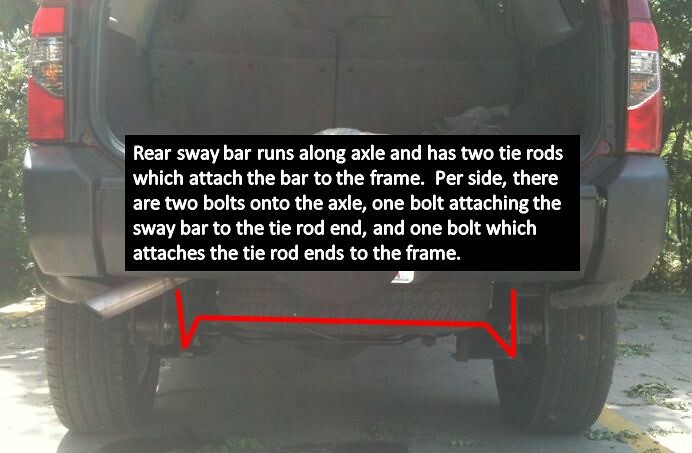 The stock rear sway bar also has the potential to cause damage to the right rear shock, which is why many people choose to remove the sway bar. Locate the rear sway bar. 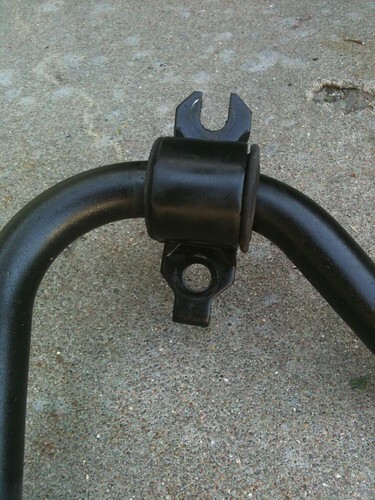 It is on the rear of the car going along the rear axle and has a tie rod on each end connecting the bar to the frame. 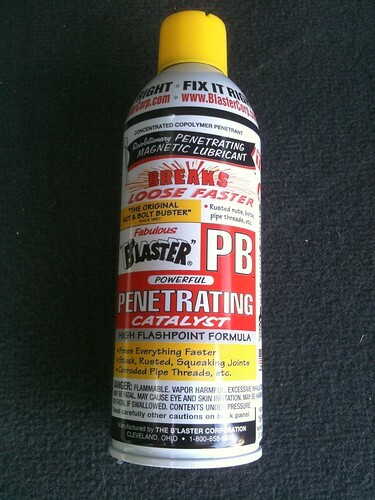 Step 2: PB Blaster!!!! If yours are really stuck, start early. Soak them, and leave them for a couple days, soak again and leave for a couple days, and have a go at them a week later with 3 really good soakings in PB Blaster. Leaving them alone for a few days seems to really help me with stuck hardware. Step 4: Remove the tie ends from each side using a 14mm socket wrench and a 14mm open end wrench. 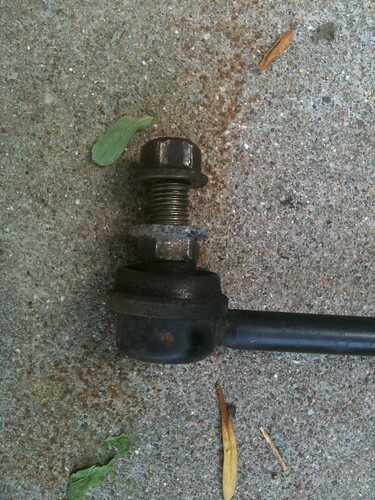 The exposed nut is easily loosened with the socket wrench. However, on the flip side of the frame bracket is a bolt head which you need to hold with the open end wrench to keep it from twisting. Look at the reference pictures below if you need clarification. Step 5: Loosen the top bolt on the axle clamp and remove the bottom bolt on the axle clamp. Look at the reference picture below for clarification as to why one is loosened and one is removed. 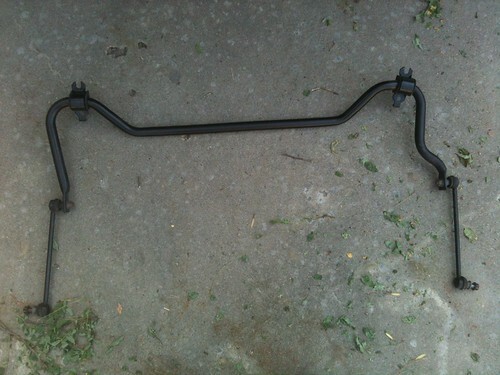 Do this for both sides of the sway bar. Tie ends...notice that you need to hold the bolt head with an open end wrench while removing the nut with a socket wrench. The axle brackets have a slot and a hole. The bottom bolts must be completely removed to allow the bracket hole to clear. The top bolts rest in the slot, thus they only need to be loosened. 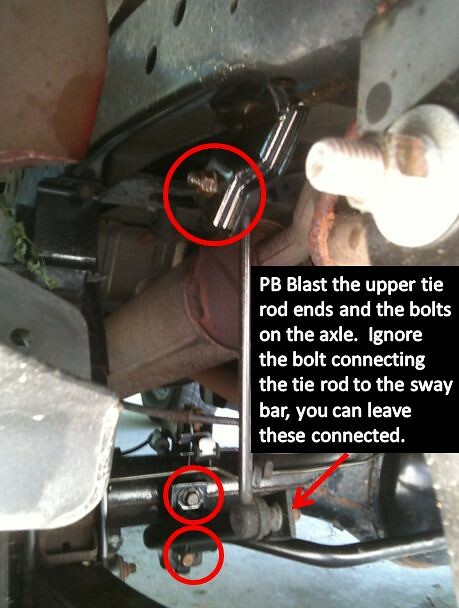 Finally, ensure that you reinsert the bolts into the axle bracket with some anti seize compound. This just plugs the holes and threads and prevents rusting. and LASTLY, ENJOY THE FLEX! Nice write up. I also appreciate the reference to reasoning behind doing this modification. I have a second gen but ill vouch for no difference in ride quality. I took mine off and haven't looked back. Plus there's one trail at the local ORV park that used to make me barely pick up the left rear tire. Now I don't and I can do it in 2wd if its dry. Simple, free, and effective one of the best kinds of mods! I've lived a long time now without the rear sway bar on my 2004. I've never once wished it was still there and only notice it's gone when the rear is flexed up so much better than before. I really like this write up and people here have convinced me to do it. What im wondering is if you have to lift the x and have the tires or whatnot droop. Since I didnt see that in the instructions or anything, im going to guess not. But best to make sure I guess. I did mine with it still on the ground. I have a 2012 Xterra which is still under warranty... anyone know if it has any affect on warranty or anything?? Will not effect the warranty. but I use a different tool to remove the sway bar,,,, nothing works faster than a cutoff wheel in an angle grinder. 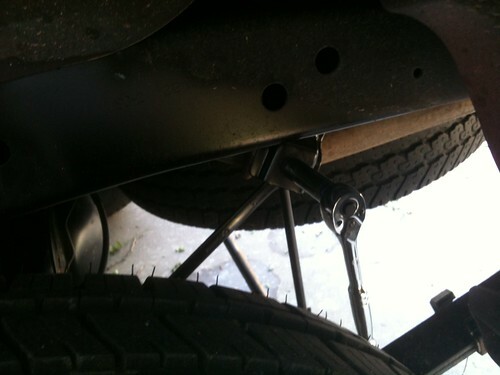 I even took off the brackets from the axle, they were in the way of the truss that I wanted to put on. But nice writeup none the less. 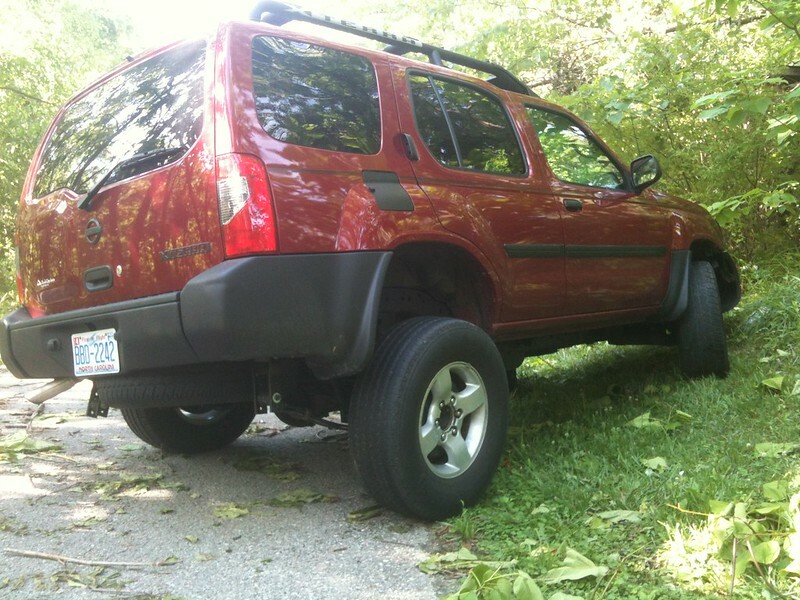 Since your Xterra is so new I would take it off all proper just incase you would need to install it back. I sold mine to a ricer 10 years ago for $50. 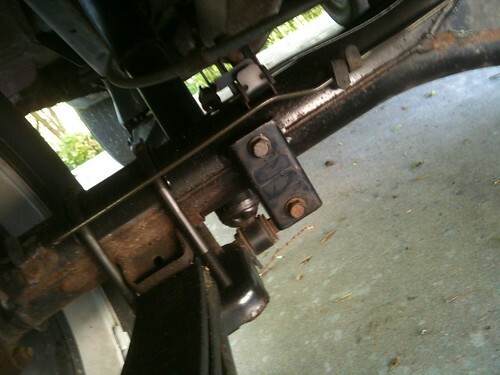 Somehow they broke their sway bar and posted on RMXC that they were looking for one. 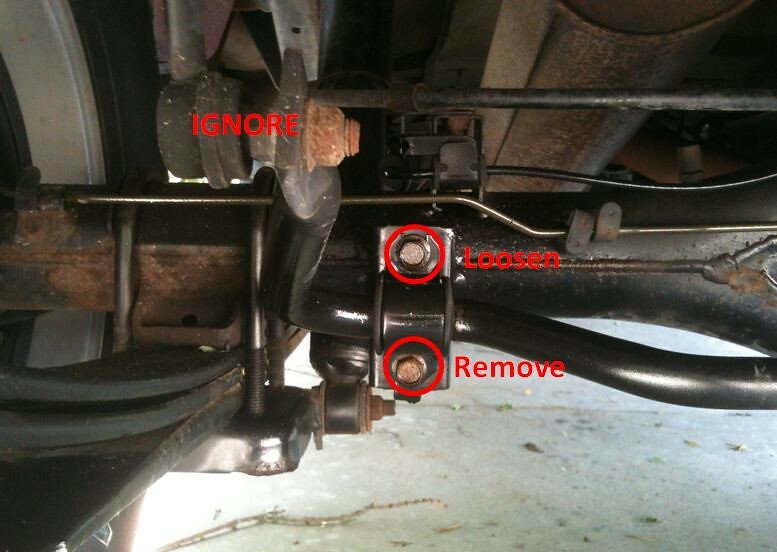 If you break something in the rear suspension and take it in with the sway bar un-installed, they may deny your claim. Simple solution to just re-install it. Do the stock/original rear shocks function the same once the swaybar is removed? Or do you need shocks with more extension and or compression? Thanks. Stock shocks are completely fine. You would only need to replace them with extended travel shocks if you added lift in the rear with shackles or new leafs.